There are two common ways N+1 can be achieved: paralleling multiple unitary UPSs together or deploying a single UPS frame with multiple internal modules configured for N+1 redundancy. 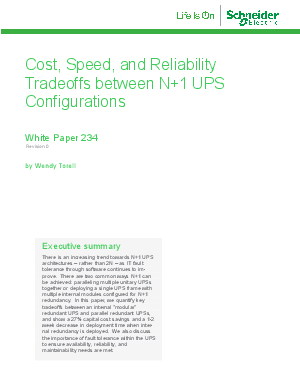 In this paper, we quantify key tradeoffs between an internal “modular” redundant UPS and parallel redundant UPSs, and show a 27% capital cost savings and a 1-2 week decrease in deployment time when internal redundancy is deployed. Discussed here is the importance of fault tolerance within the UPS to ensure availability, reliability, and maintainability needs are met.